My husband is a little anti-Valentines Day, and I on the other hand am allllll over it. I’ll take any reason to sprinkle red and pink hearts around my house and buy bags of juju cherry heart candies. 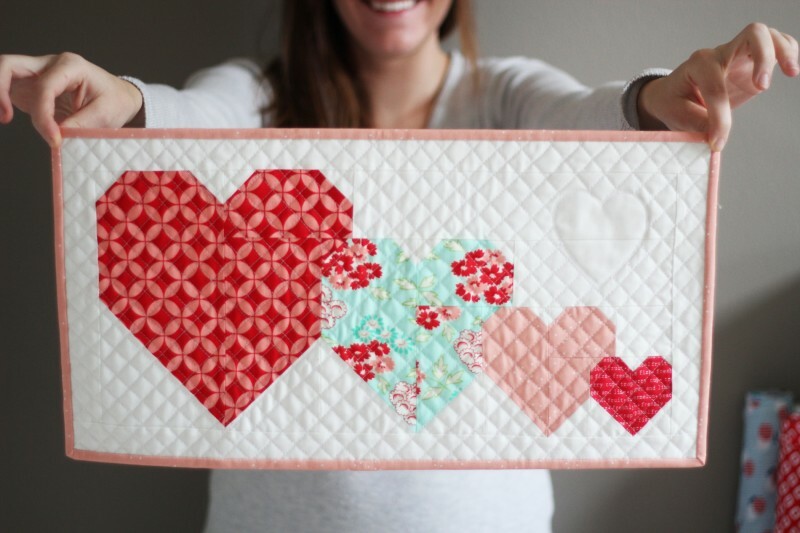 I thought about making this little mini last year when I wrote my tutorial for making heart blocks in multiple sizes. Wouldn’t it be fun if the sizes overlapped a bit and made a cute mini quilt to hang or gift? Yes…yes it would. Too many hours later I wrote up a pattern, and now I’m finally sharing it with you! It would also make a darling pillow. If I made this again I would use more contrasting fabrics…or all solids maybe? The aqua print heart disappears into the larger heart…so keep that in mind when choosing fabrics. That empty white space in the upper right was begging for some embroidery or fun quilting. 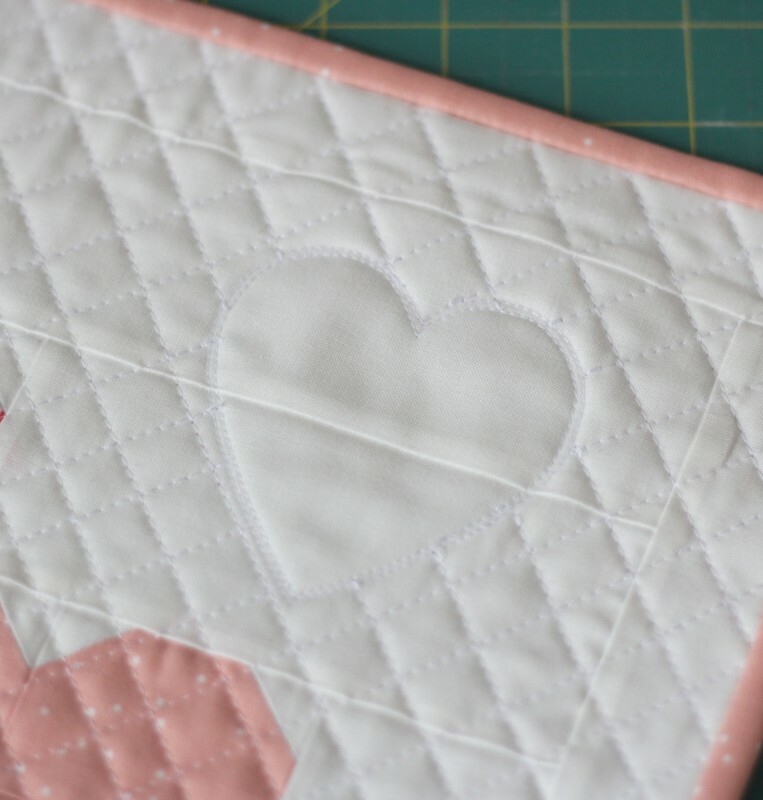 I almost embroidered “love” in the corner…then thought adding a heart in the quilting might be even better. I traced a heart cookie cutter onto the fabric with a disappearing ink pen, then went over it twice with my sewing machine to trace the heart outline. Then I quilted it normally, starting and stopping once I got to the edges of the heart. I love how it turned out, and how it looks from a distance! Happy really really really early Valentines Day! Thank you so much for this cute little pattern….this will be one of my weekend projects! It’s adorable – thank you so much! Thank you so much for this sweet pattern! Perfect little Valentine’s Day project! Thank you so much for this adorable project. Looks easy enough for even me to finish. Thanks so much!!! I really appreciate it. I sewed different size hearts last year. I can’t wait to give this a try. Thanks for sharing! I just started quilting again and your blog has become my favorite! Thank you fo this cute heart pattern and all the inspiration you share! I love it a lot! Thanks for the pattern. Hmmm… maybe I will make it this weekend! So cute!! Thank you for sharing with us! 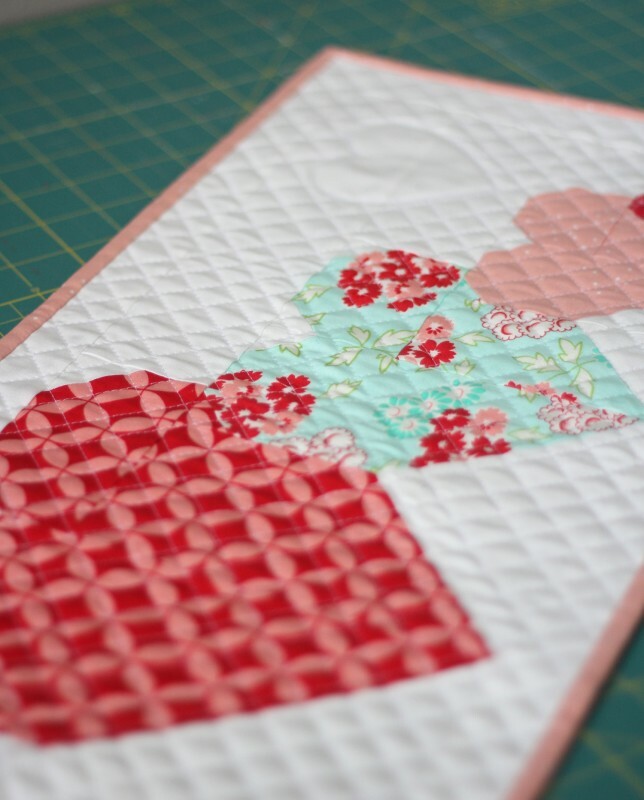 Love your mini Heart Quilt – thank you for sharing. Love the aqua one in between, wouldn’t change a thing. It’s beautiful! I think I’ll make mine into a pillow. I actually LIKE how the turquoise heart breaks up the predictability of the four hearts. This is very cute ! So adorable and I love the blue heart!! Thanks for sharing with us. I love it! I’m planning to make my baby girl a heart quilt (using your pattern and info of course) when I have time. I think I’ll have to make her a pillow now too! Thanks for sharing the adorable pattern. I can’t wait to make it!! Love it! Thank you for sharing this cute pattern. Absolutely adorable! So sweet and generous of you to share the pattern. Thank you! Thank you! Adorable. I have downloaded the pattern and may try to make this with my daughter over the weekend as Valentine placemats for her to give as a gift to her BFF. It’s sew sweet. It’s the weekend here in Australia and I’ll be whipping this up tonite. Thankyou for the freebie. Question? 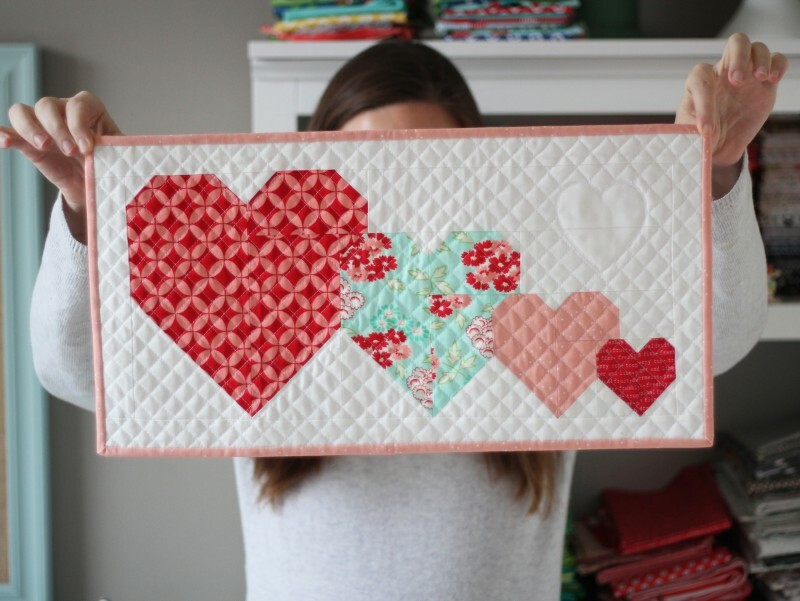 Which came first the quilted heart or the diagonal quilting? Where the quilted diagonal lines meet the quilted heart do you stop at the heart and start again or travel to the next line? Thanks. This is great! I think I might give this one a try. I don’t have many holiday-themed items for the house. And I’ll join you with eating the juju hearts. thanks for the fab pattern–I love hearts and I totally love this..I love how the one heart kind of blends in too..great design idea…. Glad you all like it! Fran – I did the heart outline first, then started and stopped each time I reached the heart, and skipped over the heart. Hopefully that makes sense! Thank you – this is a really lovely pattern…. I love this piece! And I love your machine quilting!! May I ask…your machine quilting really “pops.” What stitch length do you use? And what kind/size of thread? Many thanks for your inspiration. I love this pattern. I also love the idea of having a valentine decoration that lays flat for the rest of the year. I’m glad you had the break from quilting so that you love it again. The quilting community would truly miss your great talents. I have missed your blogs. I am so happy you get to have a beautiful, healthy baby! This is so adorable. Thank you so much! That is so sweet and pretty Allison! Thank you for doing it up as a pattern for all of us! Love it and made it!!! Thanks for a great pattern. I tried to add a link to my blog post but the comment wouldn’t post. Thanks you for sharing it is very cute…..it has shot to the top of my to do list.. Darling pattern ~ thank you so much! Lovely pattern. Lovely quilting. Well done! Wow, that’s so cute ! But why did you make rectangles inside (apart the frame) ? They broke your pattern. Thank you for sharing you darling design it’s my favorite heart pattern. I think I will extend the graduated hearts on both sides and make a table runner. How kind of you to share with us! Thank you so much! I cannot wait to get started!! thank you so much! its so cute and was fun to sew! great job cluck cluck sew! when you are sewing this do you sew right sides together or what. 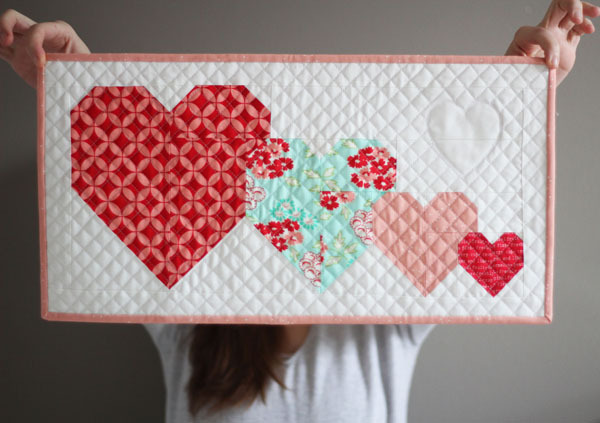 Love the “I heart you mini quilt pattern. Thank you!!!! You are sooo talented. Thank you for your generosity in sharing your pattern. I printed this pattern ages ago and finally made it over the weekend – and quilted it while watching the Grammys last night. Thanks for the quick project! Thank you! You are always so generous with all your readers.